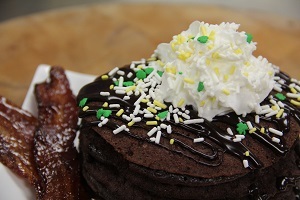 Culinary Corner: 3 Recipes Perfect for St. Patrick’s Day Brunch! There’s no better way to start off St. Patrick’s Day than by celebrating with brunch, so we’ve created recipes using our DDelicious breakfast treats to help you create the perfect holiday meal. 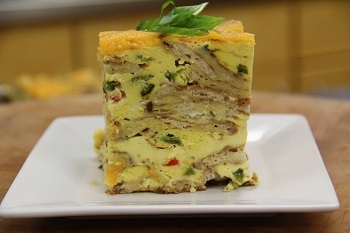 We start with a spicy strata recipe, featuring our Spicy Omelet Flatbread, and pair it with a Dark Roast Candied Bacon. 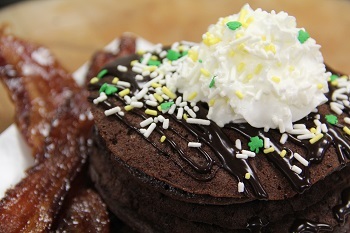 Finally, we add a little luck of the Irish with Brownie Pancakes topped with Dunkin’ Donuts Mint Hot Chocolate Ganache. Try these this weekend or save them for a perfect start to your St. Patrick’s Day! Our Spicy “egg”ceptional Omelet Strata made with sriracha and our new Spicy Omelet Flatbread will be sure to spice up your morning! This recipe, featuring layers of eggs, melted cheese and spices, will be the centerpiece of your brunch and will definitely heat up your winter! 2. Grease a 9x13” baking dish and set aside. 3. In a large bowl, combine all ingredients except the Spicy Omelet Flatbreads and cheese, and whisk to combine. 4. Add sandwiches and stir to combine. 5. Pour into greased baking pan and bake for 30 minutes. 6. Remove from the oven and sprinkle cheese on top. 7. Bake for 10 more minutes and the remove from oven, allowing to cool slightly before serving. 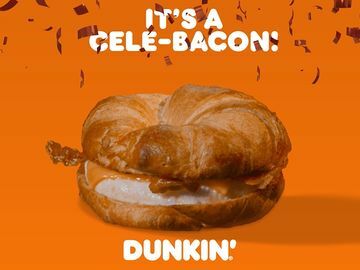 Nothing screams breakfast like coffee and bacon, so why not combine the two together? This recipe with bacon coated in brown sugar and Dunkin’ Donuts Rainforest Alliance Certified™ Dark Roast Coffee will combine savory and sweet elements to be the perfect side to your Spicy Omelet Strata! 3. In a small sauce pan combine the Dark Roast Coffee and brown sugar and reduce by 1/2 or until thick and syrupy. 6. 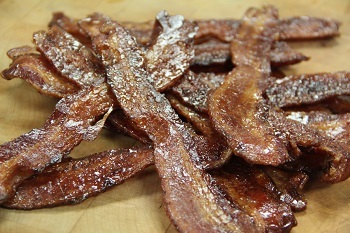 Remove pan from the oven and using tongs remove the bacon from the sheet pan immediately placing the bacon on parchment paper to cool (if you leave it on the pan it sticks to the pan and that's no fun). To top it all off, we’ve whipped up a sweet, chocolaty pancake creation sure to STACK up to the rest of this perfect brunch! These Brownie Pancakes with DD Mint Hot Chocolate Ganache will have bursts off refreshing, chocolaty goodness in every bite. 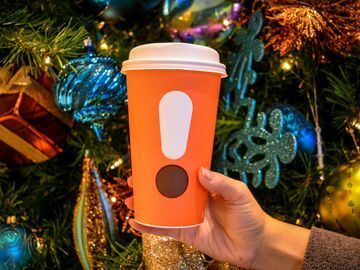 For an added flavor bonus, pick up extra DD Mint Hot Chocolates to drink with your meal! 1. In a large bowl combine all ingredients, mixing only until all ingredients are combined. 2. Preheat a pan over medium heat and spray with cooking spray. 3. Scoop small dollops of batter into the pan and turn when bubbles begin popping on the top of the pancake, then turn. 1. 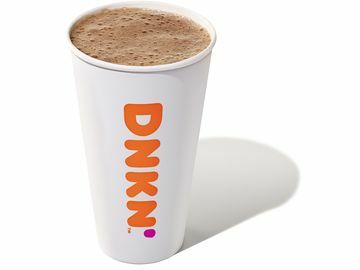 In a microwave safe bowl, combine chocolate chips and Dunkin’ Donuts Mint Hot Chocolate. 2. In 30 second intervals, microwave the ganache and stir in-between each time, repeating until the mixture is smooth. 3. Pour over brownie pancakes and enjoy the deliciousness. Don’t have time to make breakfast, but want to keep the day festive? Pick up a dozen of our Shamrock Sprinkles Donuts, available at select Dunkin' Donuts' restaurants nationwide for a limited time! This yeast ring donut is decorated with chocolate icing and a shamrock sprinkle mix, and is perfect to make any donut lover feel extra lucky. For something sweet later in the day, we recommend heading over to our friends at Baskin-Robbins who have a St. Patrick’s Day ice cream cake that has us seeing green. 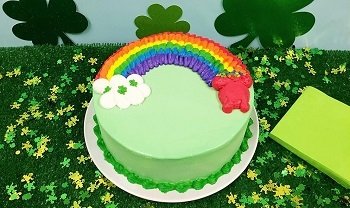 Follow the rainbow on this Leprechaun-approved cake to a pot of Ice Cream and Cake goodness. *How did your St. Patrick's Day brunch come out? 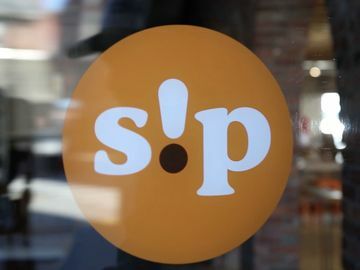 We would love to see your results on Facebook, Twitter or Instagram! 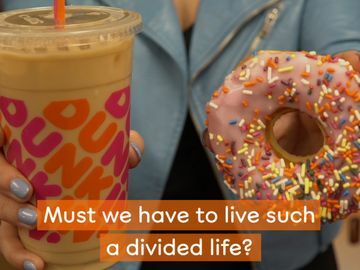 For more ideas and tips on cooking with Dunkin’ products check out more recipes here!